In partnership with business leaders as well as state and local partners, the Workforce Development Council of Seattle-King County (WDC) leads, directs and oversees the Seattle-King County public WorkSource system as a part of the American One-Stop Job Center Network. WorkSource Seattle-King County provides effective workforce employment and training services to a wide variety of youth, adults, and businesses through interagency partnerships, leveraged resources, and the delivery of services through a network of geographically targeted one-stop locations. Services are free and can be accessed at any WorkSource location. Click here to learn more about WorkSource Seattle-King County Resources! 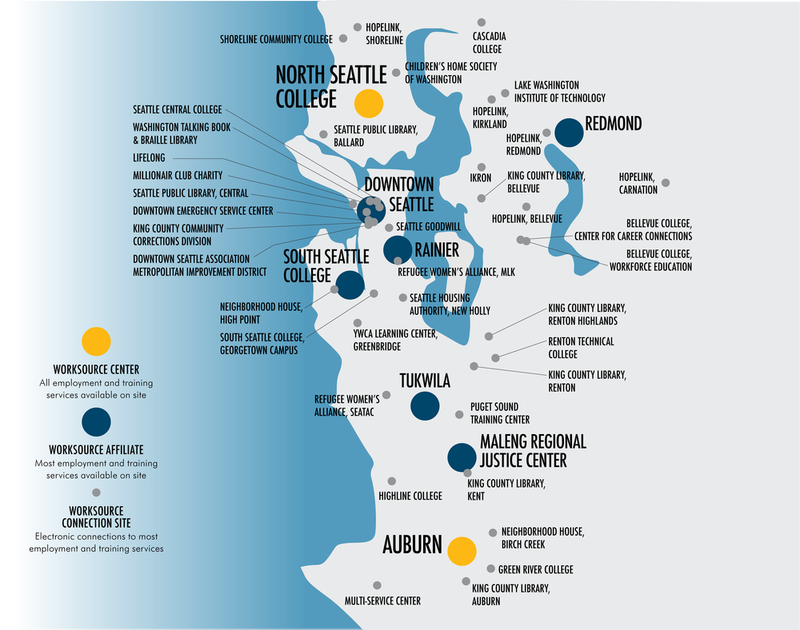 WorkSource Seattle-King County's Full-Service, One-Stop Centers offer direct access to staff, free workshops, and on-site services. All mandated Workforce Innovation & Opportunity Act (WIOA) partners are located on-site and provide comprehensive, wrap-around services. WorkSource Seattle King County Affiliates offer direct access to staff, free workshops, and on-site services. WorkSource Seattle-King County Connection Sites offer dedicated online access to WorkSource resources and services. Connection Sites do not receive funding, but do receive signage and outreach materials to support their WorkSource partnership. WorkSource Seattle-King County is not taking Connection Site applications at this time.